My ability to build brass kits is limited, but I've decided that I won't let it keep me from modelling the pre-grouping world that I find so fascinating. Instead I try to make the best of whatever skills and means I have available. Here's a few examples of what I like to call "calculated bodging"! 1. Simple kits. Above is a Toplight Composite Slip to diagram F15, built from an ex-PC Wheeltappers kit. These feature pre-printed sides, which gives a quickly finished coach but also means the sides have no relief when viewed close-up. For today's spoiled modeller the latter can be hard to accept, but it gave me confidence to continue with kit building, and a rake of these does look rather good when moving by. Sadly, I hear that Wheeltappers are no longer renewing their stocks. Fortunately there are other simple kits available for the pre-grouping modeller. 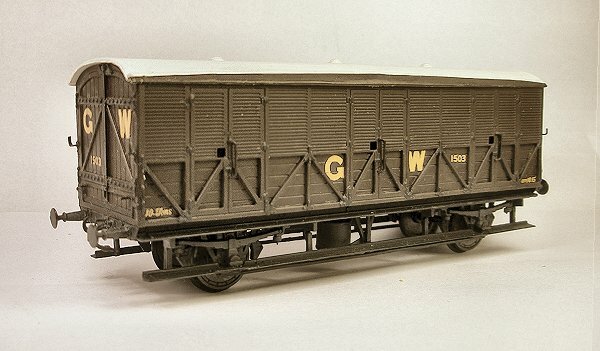 This includes the Ratio 4-wheelers, and I've written up a brief introduction to these over on the GWR Modelling site. 2. Kit-bashing. The standard features of many GWR coaches allows some possibility for hacking up sides in order to join them in new ways. 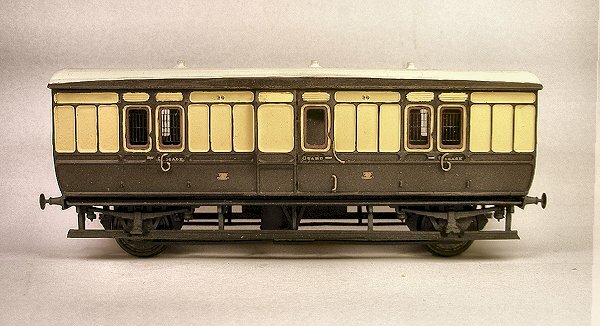 This W1 Parcels Van was composed of two Ratio brake thirds, following an idea from J. Russell. I've done some notes on the build here. I don't really like pristine white rooves any more, so they are due for a repaint. Edit: For some excellent additional examples, have a look at buffalo's blog. 3. Conversion kits. 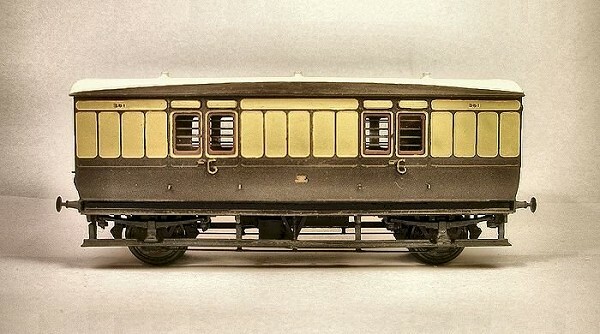 This is a Siphon C built using the Shirescenes etched brass body kit fitted on a modified Ratio 4-wheeler chassis. 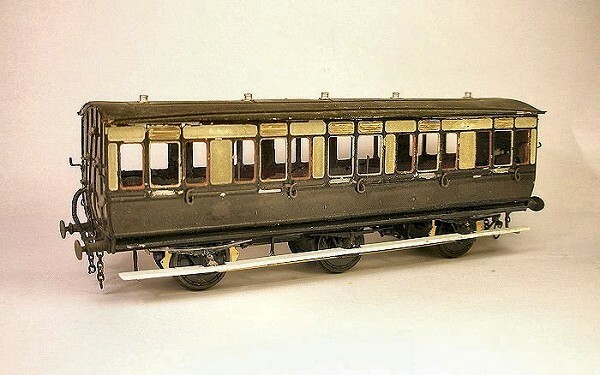 The body is brass, but has been treated so that it can be assembled with superglue. You can read how it was built here. The Shirescenes kits offer a number of good conversions of the Ratio 4-wheelers. There are more examples here. 4. RTR bashing. There's something strangely satisfying about sawing up RTR coaches to produce different diagrams. This is a V5 passenger brake van, built from the ends of two old Triang clerestories. Again, there's a write-up of the job on gwr.org.uk. While on the topic of RTR coach bashing, have a look at the current work being done by rovex, which although not pre-grouping shows nicely what can be achieved. 5. Restoration. Bringing old second-hand stock back to former glory is a favourite pastime of mine. This 6-wheel Compo to diagram U21 is a current example. She looks a little sad right now, but there's a warm heart beating in there! The model was originally built by Chris Edge, using what I believe was a very limited production run of kits that he made largely for his own use. My restoration has so far included new step boards (always a weak point) fashioned from strengthened Plastikard, as well as simplified Comet brake shoes, Romford pin-point bearings, Alan Gibson wheels, and gas lamp tops from IKB. 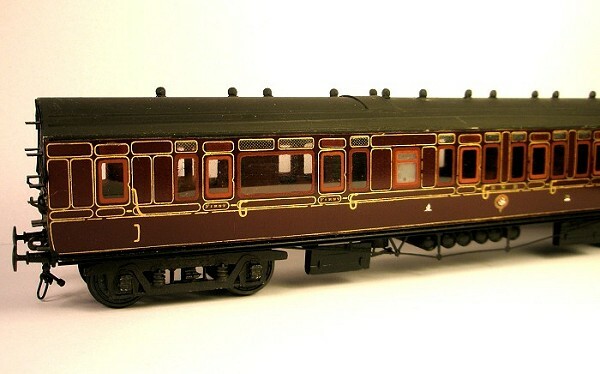 I'll also add a new interior, new glazing and give the coach a complete repaint.